I think that's because I haven't been reading that much at all, so when I want to read I (obviously) want to read the ones I still haven't read. But after rereading Anna and the French Kiss (and the illustrated Harry Potter and the Philospher Stone, but that doesn't count as much because of the added images) I realized how much I miss rereading. So I decided to make rereading a much higher priority. It's also nice to reread a book when you're so busy with many other things, because you don't have to be completely focused (since you already know the story) and still notice things you didn't notice before. I claim this trilogy as one of my favorite dystopian trilogies, but I haven't read it since about three years ago. This is also one of the dystopian trilogies that I haven't reread yet (I have reread The Hunger Games and Divergent trilogy multiple times and love those as well) so it's about time. For some reason I just have to urge to reread this one, but I don't own it yet (back in the days I read it on my ereader which I don't have anymore). Last year when the movie came out I didn't watched it, but I do want to watch it now. Before I'm going to watch it I'd like to reread it and since it's so short I don't have any excuse not to. This classic is the really first classic I ever read and I didn't like it back then. I would like to reread it, so I can see if my opinion will change now I've read many more classics, or that I still don't like it that much. So many things happen in this book, that it was a wilde ride to read it. That's the main reason I want to reread it. After I first read Jane Eyre I had the plan to reread it every year (because it's one of my all time favorites), but I haven't done that last year so I kinda want to reread it before the end of this year to make up for it. This is also a favorite of mine that I haven't reread for so long and I just have the urge to reread it. I hope to get to it around Christmas time. Do you reread books or would you like to make it a priority? What books to do you like to reread? Chimamanda Ngozie Adichie is one of the first (John Green is my first, but I read all of his books a while ago). authors which I've read every single book by, so I thought it would be a great idea to tell you how I wanted to read all of her books and my review of each one. At first I heard Booktubers talking about how great Americanah was and they also mentioned the Ted talk called ''We Should All be Feminists''. I watched that talk first and it got me excited to read all of her novels. You can watch the video here. There is also a written short novel, but because I think/heard it's the same text as in the video I decided not to buy and read that one. I decided to look up her other novels and found out that she has three main novels and one short story collection, so I bought the entire novel collection first and so I read them with the essay/letter Dear Ijeawele, or a Feminist Manifesto in Fifteen Suggestions and the short story collection (called The Thing Around Your Neck) in between. My opinion is that her first novel, Purple Hibiscus, is her best novel. It made me feel and blew my mind. It's about a fifteen year old girl in Nigeria and what made it so feel so much is because of how she (and most likely) girl were treated back in the days and even in 2017. I'm glad I read this novel first and not Americanah. Then I decided to read Americanah, but I was a bit disappointed. I think it's because she keeps repeating her themes and how she thinks about a certain topic over and over. I understand that she has those opinions and I agree with them, but sometimes it gets repeated too many times. I also found the novel a bit lengthy and it didn't make me feel as much. It's also about culture difference (Nigeria vs The United States) and I liked that part, but it could've been explored more (it was a bit flat to me). This year was also the release of Dear Ijeawele and even though it includes the same topics again, it was written differently and it also talked more on how to raise your children in a feminist way (like don't let gender hold both of them back) and I loved it! It was also short and fast paced and straight to the point. I got excited again about the one I haven't read back then and decided to read Half of a Yellow Sun (I still haven't watched the movie adaption of it, is it good?). My personal opinion is that it's not as good as Purple Hibiscus, but way much better than Americanah. It made feel, but it was kinda lengthy and some parts (only a few) were a bit boring and there wasn't that much feminism talk in it. After I finished all of these books I finally read her short story collection. It's my least favorite of hers and that's because I'm not that much a fan of short stories. I liked some of them (the first two) but I disliked at least the half of them. When I liked a story I wanted to read more... There were also so many foreign names in it that it got a bit confusing as well (which makes sense, because they took place in Nigeria). So here's my conclusion and suggestion. I still loved all of her books and recommend to read them all (but Puplre Hibiscus will always be my favorite and not Americanah). If you haven't read any of her novels, I suggest to watch the Ted talk first. If you like what she's talking about, then read her novels in chronological order and read Dear Ijeawele after you've read Purple Hibiscus. Then you get the most out it, I think (or you can do it the other way and start with my least favorite and build it all the way up, but that's up to you). What's your opinion about Chimamanda Ngozi Adichie? Which one is your favorite and your least? When I first saw this tag I knew (at Kassidy Voinche's channel I had to do it too. You can read the original tag here. I have two different tbr's, but you'll see that in the answers as well. I use the Goodreads general tbr shelf, which are books I want to read but don’t own yet and I’ve made an extra shelf (you can add a shelf to the traditional shelves ‘’read, to read and currently reading’’ called ‘’Books I own tbr’’. My general tbr shelf: 86, my books I own tbr has 56 books. Print! I don’t read ebooks. Usually I complete a series before I start new one, so a sequel, or I just pick one I’m most excited for at the moment. The book I own the longest and still haven’t read is Oliver Twist by Charles Dickens I own it since the beginning of 2014). On my general to read shelf I have What Happend to Goodbye by Sarah Dessen. Just added the memoir of Call the Midwife on my general tbr and added Fingersmith by Sarah Waters , When Dimple met Rishi by Sandhya Menon and Twenties Girl by Sophie Kinsella on my books I own tbr. 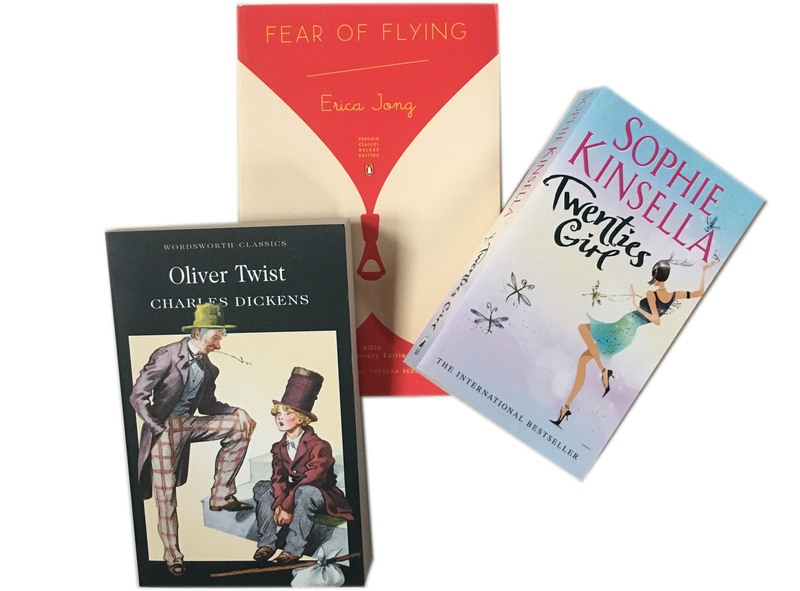 Definitely Fear of Flying by Erica Jong! When you look it up you can see the inside flaps and they make the cover just really awesome. The Hunchback of Notre Dame by Victor Hugo..
Turtles all the way Down by John Green definitely. When Dimple met Rishi for sure. The Handmaid’s Tale by Margaret Atwood. Not recommend just to me but everyone has been recommending it in general. Ah so many! Basically almost all the books I own and haven’t read yet. I’m most excited for the ones I added last on my books I own tbr, but The Handmaid’s Tale and Our Dark Duet are right now the ones I’m most excited for (but that changes every day haha). What book are you dying to read? At the end of last year I made a decision not to post anymore. Mainly because I didn't have much time to read. There were also other reasons why I didn't want to post anymore and one of those reasons was that I was that I didn't want to post regular monthly wrap-ups and hauls anymore. That's kind of obvious if you don't have to read that much. I didn't have inspiration left on what to post... until a few days ago, which means I'm back! Suddenly I had all the inspiration: new topics I want to talk about and loads of design ideas (in case you have forgotten: I'm studying Media Design (which is graphic design, but then more things you can design) and suddenly I had loads of ideas on how to combine them. So that's what I'm going to do from now on. - bookish thoughts, because I want to talk about loads of topics like making time for reading, ebooks vs. physical books, going to the library, living in a country where English isn't the mother language and what that means with buying books etc. etc. so if you have suggestions on this: please let me know! - infographics about my reading wrap-up at the end of the year and other interesting infographics. I also have some ideas that I'm not so sure about, so we'll see. The main thing I want to focus on is on being creative and mix books with design as much as possible. There will also be another thing I wanted to change: uploading on a specific time and day. At the beginning I'm going to post on Sundays at 3pm (Amsterdam time), so most people can read the post as soon as I've uploaded it. I'm curious to see if I can stick to it, but I'm going to try my best to do so. I also hope you're excited about it as I am! What are you looking forward most on seeing on my blog? At the end of the year I've decided to stop posting on this blog. I wanted to explain why but Booklikes have been down since today so that's why I couldn't post this earlier. For the last few years reading has been my one and only priority. That was the only thing I did when I came home from school and what I did in the weekends. I was studying Translation, so that's why I also was more interested in reading than I am now. I quit that studies in April last year and that's when things began to change for me. I started dating and have been in a relation ever since (and we got a puppy too!) which is one of the reasons why reading has been less of a priority. Which is also great, because life is also great and more excited than just to only read (haha). This September I also started a new studies: media design. I don't only make stuff digitally, but also by hand. Since then I am drawing more but still not as much as I want to, so I really want to focus more on drawing (and digital designing) which means I don't have that much time read anymore. Since August I only read like 7 or 8 books. Usually I read 5 books a month so that says something. So the time I have left in my schedule for reading and blogging is so limited now that I decided to focus more on reading and even way less on blogging. I also have so many unread books that I own and want to get to, that I also buy less. I'm still going to post on my Goodreads and Instagram (which means I'm going to post the reviews I used to do here fully on Goodreads now and my reasons behind by bookhauls now on Instagram too) so I'm not going to fully stop, but only stop posting on this platform. So you can follow my Goodreads here if you haven't already and by Instagram here. So this has nothing to do with Booklikes, because it's perfect platform for bookblogging, but just because of my priorities. What are you Goodreads and Instagram? If you post it I will follow you too if I don't already. I didn't like the first half of this book and I just couldn't get into the story. However, the second half was much better and from then I wanted to know what was about to happen. But if I have to be honest, I like The Lunar Chronicles much more than this series so far. I loved the Alice in Wonderland aspects though. What is your opinion about Heartless? Ps. I finished this book right before the year ended, but Booklikes have been down until today so that's why I'm posting this today. Heartless was one of the most anticipated books of the year (because I loved The Lunar Chronicles), but it took a while before I could order it. Now I finally have it! I already have the entire non-fiction by Orwell, but in a bindup. I decided to buy this one because the bindup is way too big to take it everywhere with you (and a friend of minde said she would like to buy 1984 when I read it). I also got The Bone Season from her, because she had a duplicate and asked if I'd like to has this one. The next books I want to collect/get are the books in A Darker Shade of Magic series by V.E. Schwab (since the last book in that trilogy comes out at the end of February) and because I want them in hardcover, I'm only going to buy one book a month. What are some of your recent book purchases? At first I found this story a bit weird and it took me a little while to get into, but I started liking it more after I read the first three chapters. I think the reason why I didn't like it at the beginning is because the story is very strange and it also has a quite creepy feeling. However, I really liked the rest of the book and the message. This story is a story about living and dying and that you should really, really try to make as much as possible out of your life (and about growing up). Neil Gaiman also said in the acknowledgements section that he read and reread The Jungle Books (by Rudyard Kipling) many times as a child and I could see some similarities (that I just noticed when I found out about it) like that being stranded as a baby etc. (thought that was a fun fact to share). This was my first book by him and I'm quite excited about his other books (especially Coraline). If you haven't read this one I recommend it to check it out. 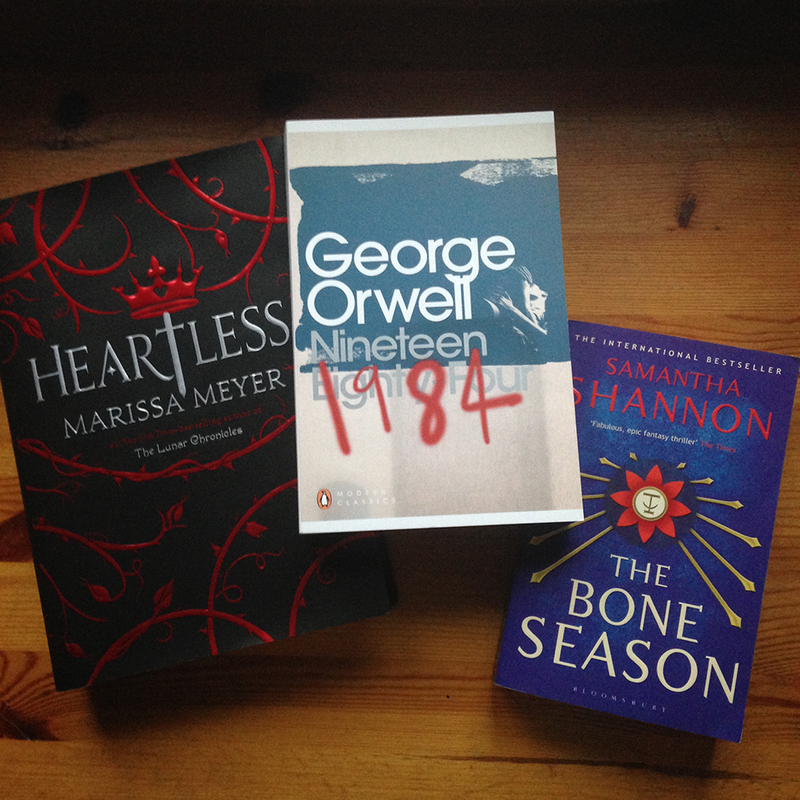 I would also like to get to some by George Orwell (and read all my unread books by Sarah Dessen (I only have to read 4)) and I have quite a few that I hope to get to, but these are the ones I really, really would like to get to. What books are on your 2017 tbr list? "Strange man, how can you have eyes for sale? Eyes? Eyes?" The disturbing tale of a young man's obsession with the Sandman, stealer of eyes, which has inspired writers from Sigmund Freud to Neil Gaiman. I know this is a crappy summary, but it describes it actually perfectly (I don't know about that Neil Gaiman part, because I haven't read anything by him yet). This is a famous German classic. I had my eyes on it for a while (my plan was to read in German back when I had to read some German novels; glad I didn't read it back then though, because a) I don't know that much German and b) I think it's even better in English (I can't compare it though, but I mean that I understand it now more I think than when I read it in German). KarinaE (over at Booktube) read it and ever since I wanted to read it too, so I was really excited when I found out it was going to be published in this edition. This story is dark, but really good. It's about how obsession can drive you crazy; how dreams and desire can drive you crazy too. This tale begins with three letters, but then it continuos through the eyes of a writer (it's strange yes, just read it) and then he tells us what happens next. I hoped it would be a tale through the young eyes of the character, but most of the story is from his adult point of view. However, I still liked it and recommend you guys to check it out as well. Have you ever heard of The Sandman and if you have read it: what's your opinion about it? I wanted to wait with this bookhaul until I got the last few books of the year, but I decided to show them now to you already. Finally (yes finally) I got some books by Neil Gaiman. 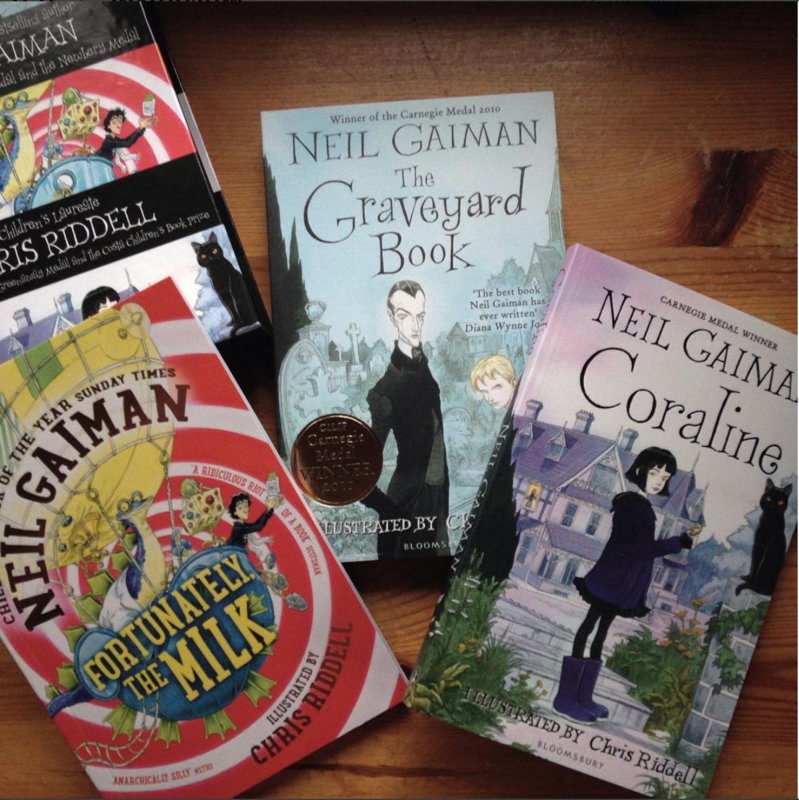 I'm not that interested in American Gods etc., but I really wanted to get and read The Graveyard Book and Coraline. I love children's literature (as you could have already guessed if you look at what I've read this year haha) so I'm really glad I finally got those two. I decided to go for the boxset because those covers look amazing! My plan is to start The Graveyard Book after I've finished my current read, so that's why I wanted to show you guys this boxset now. 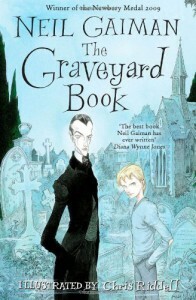 What is your favorite book by Neil Gaiman? "The Catcher in the Rye" is J . D. Salinger's world-famous novel of disaffected youth. Holden Caulfield is a seventeen- year-old dropout who has just been kicked out of his fourth school. Navigating his way through the challenges of growing up, Holden dissects the 'phony' aspects of society, and the 'phonies' themselves: the headmaster whose affability depends on the wealth of the parents, his roommate who scores with girls using sickly-sweet affection. Written with the clarity of a boy leaving childhood behind, "The Catcher in the Rye" explores the world with disarming frankness and a warm, affecting charisma which has made this novel a universally loved classic of twentieth-century literature. I surprisingly really liked this novel. It was a bit slow at the beginning, because Holden is very moody etc., but the writing style kept me going and I ended up really liking this novel. I do understand why this is a classic that most people in USA are required to read in school (I didn't read in school, so I picked it up because I wanted to), because you can learn something from it (or even realize something about life and/or society) and it's (I think) relatable to most teenagers as well. Everybody feels kinda depressed one in a while and thinks about dropping school. This is also a very accessible classic, because it's very easy and quick to read and feels like you're reading just a YA novel. And another reason why I think it's so relatable is because Salinger made the characters so very realistic (which I really loved). Oh and I personally also really liked Holden as a character (which is a very unpopular opinion I think? ), even though he could be sometimes annoying to other characters. Those part where even funny to me. So if you like to read YA novels and want to try a classic: read this one! You can also read it if you usually don't read YA; this book is just for everybody. I personally really, really liked it and I'm glad I gave it a shot. What is your opinion about this novel? Did you have to read this one for school or not? I really liked this story (obviously) and his aunts were so awful damn! I've never read it before nor have I seen the movie, so when I finished the book I watched the movie as well. The 1996 adaptation was okay; there were loads of things that were left out and added that didn't make sense. In the movie there's a transition between James as a real life person and an animation version of him. There are also more song in the movie than in the book, the cloud-men and the rainbow were left out in the movie and the ending was also different. Also; in the movie James talked a lot about New York and dreams and stuff, but in the book he doesn't talk about it, he just wants to ge out of his aunt's house and be free. The last thing that I noticed was the animation style; they animated the insects quite creepy and it was a bit weird how they put the animation together. However, I still enjoyed it, but it isn't my favorite Roald Dahl adaption. The book was much, much better. What is your opinion about the book and movie? Oh I really, really like this novel! It has only 87 pages, with big text and loads of images, so it's a really fast read and exactly what I needed right now. The story itself is also brilliant, unique and makes you laugh as well. 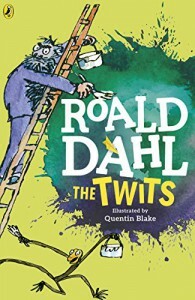 I think this one was also unique from Roald Dahl's point, because this tale is a tale from the perspective of adults and there are no children in this story whatsoever, however you can still read it when you're a child (and of course also when you're an adult). If you haven't read this one by Roald Dahl I highly recommend checking this one out! What is your opinion about The Twits? I finally bought this amazing boxset! I've been wanting to get his children's books for a few years now, but they were too expensive or I wanted to get other books as well. I've read The BFG and The Witches this year and last year on my IPad, but now I finally have a copy. I've also watched the movie adaptations of those two and also of Charlie (I don't remember anything about Matilda), but I don't know nothing at all about the other books so I cannot wait to read them all! 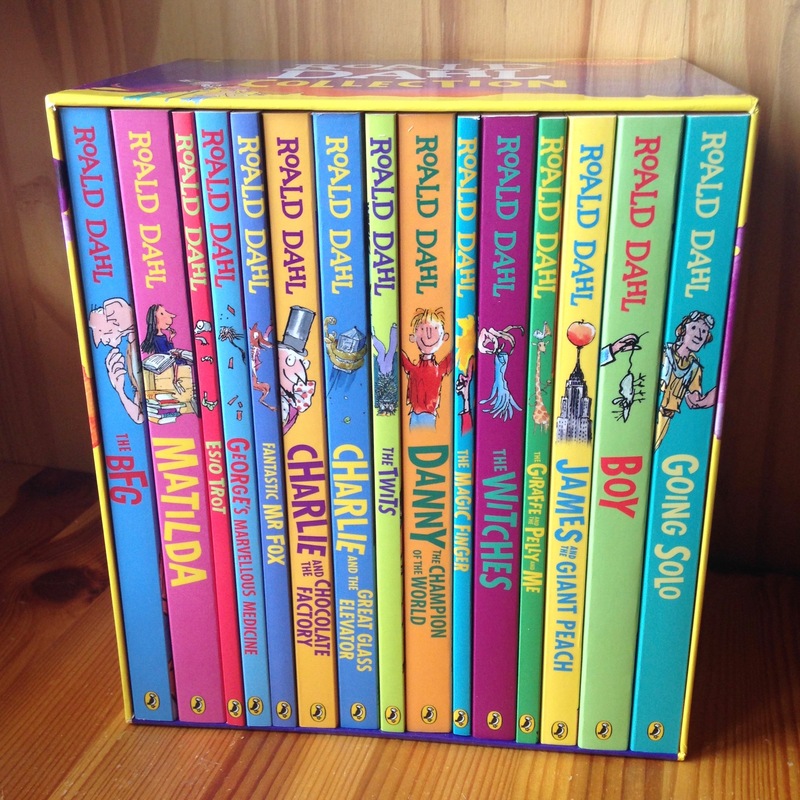 What is your favorite children's classic by Roald Dahl? In my last bookhaul I told you guys that I was planning on going to a huge booksale thing, so here's my bookhaul! I would too many books in my opinion, but I really want to read them all and I paid less than 20 euros in total for like 8 books, so yay! I also ordered two books and they came in the mail today, so I thought it would be the perfect time to finally show them. As you can see, all above are classics. Those are the ones I bought for less than 20 euros. 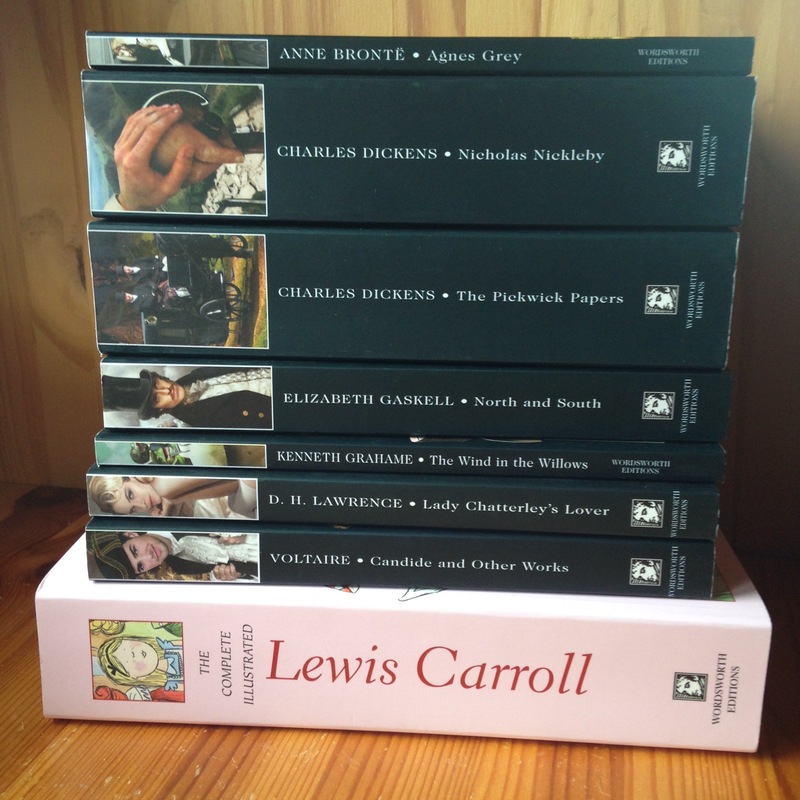 I'm so excited to read all of them (I've already read Alice in Wonderland and Through the Looking Glass, but I wanted to get his entire collection) and some of them are on the Rory Gilmore list as well. Which one of these are you most looking forward to seeing a review? I've been wanting to collect (almost) every book of both of these authors so I thought it was about time to get them. The only book I now need to get of Adichie is We Should All Be Feminists (but I already watched her speech on TedTalks so not sure if it's worth to buy it). 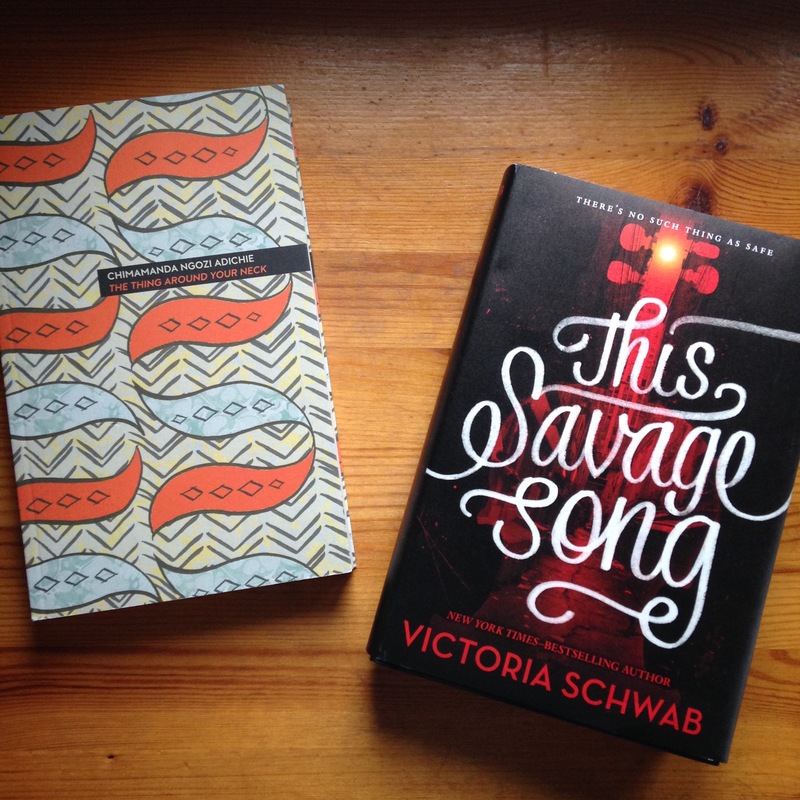 I also bought This Savage Song by Victoria Schwab. First I wanted to wait until this entire series is out, but because I want to get all her books in hardcover I decided to buy them once in a while. My plan is to buy A Darker Shade of Magic and the second book in that series too, because the third and final book in that trilogy will be coming out in February. I also cannot wait to read more by these authors! What is your latest book purchase?